First make the choux pastry. Put the butter into a medium saucepan with 200ml cold water and bring to the boil, melting the butter. Once it has melted, tip in all the flour and a pinch of salt, then remove the pan from the heat. Using a wooden spoon, beat the mixture really well for about 20 seconds until it comes away from the sides of the pan and forms a ball. Leave to cool completely. You can transfer it to a bowl if you want to speed things up. Preheat the oven to 200°C, gas mark 6. Once the pastry mixture has cooled, start beating in the eggs, a little at a time, until it is shiny and of reluctant dropping consistency. You may not need to add every last drop of the egg to reach this stage, so stop when it gets to the correct consistency. To test this, scoop some of the mixture onto your spoon: it should need a small nudge before dropping off and falling back into the pan. If it needs a flick of the wrist to help it slide off the spoon, then you should beat in a little more egg. Line the baking sheets with the parchment. Pipe 20 walnut-sized blobs onto the sheets, spaced evenly apart or spoon them out and smooth into balls with a wet finger. Bake on the top shelf of the oven for 30–40 minutes. However tempted you are, do not open the door until at least 25 minutes have passed. The profiteroles should appear golden-brown; also, tap them to see if they are firm – they should sound hollow. Once ready, remove them from the oven and, using a skewer, make a hole, big enough to take the 7mm piping nozzle, in the side of each one. Bake for 5 more minutes to dry out the insides, then cool on a wire rack. While the choux pastry is in the oven, make a start on the crème patisserie. Scrape the beans from the vanilla pod into a pan with the milk and cream. Bring to boiling point, then add the empty vanilla pod. In a bowl, beat together the egg yolks and sugar, then stir in the cornflour to make a paste. Remove the vanilla pod (wash it and save it to infuse a jar of sugar) and pour the milk onto the egg mixture, beating until smooth. Return to the pan and bring to the boil, stirring the mixture constantly until it thickens. Put it to one side and allow to cool completely. To make the chocolate sauce, first chop the chocolate. Bring 3 tbsp water and the butter to the boil in a small saucepan, Remove from the heat and stir in the chocolate and syrup until smooth. To assemble, fill the piping bag with the thick crème patisserie and squeeze a little into each bun. Don't fill them any more than 2 hours ahead: they'll go soggy if left standing for too long. 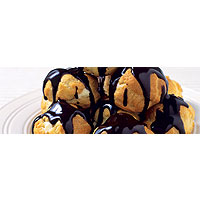 Pile up the profiteroles in a dish and pour over the hot chocolate sauce.